Maison parfaite très bon Accueil. Tous y est il ne manque rien. Gare proche donc pratique pour aller à Rome. We were warmly welcomed by Julia when we arrived on a very hot Saturday in mid-July. 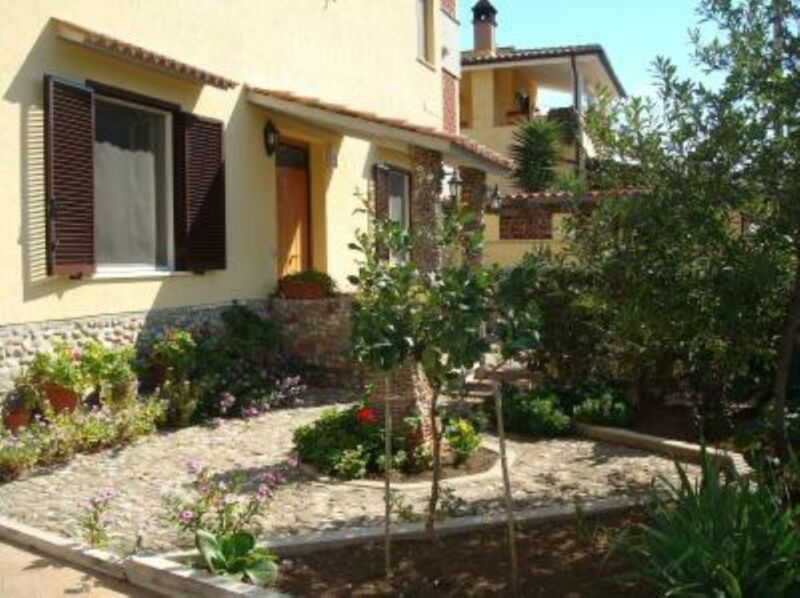 The villa is conveniently located in Ladispoli less than 5 minutes from the train station which takes you to central Rome in 30-40 minutes (trains run every 20 mins). We found Ladispoli to be a convenient base for also exploring further afield and found that the attractions in Tivoli and Ostia, the ancient port of Rome were only one hour away by car. The Villa itself was nice and cool with excellent facilitates throughout and air conditioning in the main living area. My son who did most of the cooking enjoyed using the clean and tidy Kitchen which had excellent cooking facilities. The wifi was slightly slow but Frank the owner said that this was being worked in in the coming works to improve the speed. So if you would like to visit Rome but spend time in a beach resort at the same time Ladispoli is the place to stay. Thank you for a great stay Frank. La casa è accogliente, molto curata, pulita e non manca niente. Ottimo appoggio x visitare Roma e dintorni. This was our first time renting a home instead of hotel. It's a beautiful cozy home. We love the city of Ladispoli as its very live into late at night. The house has a charming yard, air conditioner and was very clean. Very spacious. It has everything from hair dryer to all kitchen ware, games, books, towels. All you need is groceries. The house was fully equipped. It has a gated parking for one car. Very safe town. Will definitely stay there on our next visit. It was our pleasure to have you stay at our house. We look forward to have you as our guest in the future. Nulla da aggiungere rispetto alla descrizione. Casa accessoriata e spaziosa, 3 minuti a piedi dalla stazione e una decina dal mare percorrendo la via principale di Ladispoli. Dalla stazione si può raggiungere direttamente Roma,la fermata di San Pietro e a circa 20 minuti di treno. L' accoglienza e la gestione delle chiavi viene effettuata da una signore che vive in adiacenza all'abitazione e quindi disponibile per ogni eventuale problematica. Il Signor Lui e il suo gruppo saranno sempre benvenuti nella nostra casa. (Texte traduit automatiquement) Maison qui peut «accueillir de 4 à 11 personnes, avec 3 chambres, 2 salles de bains, nouvelle cuisine, avec lave-vaisselle, four, cuisinière, four à micro-ondes, salle à manger et salle de séjour, d'une télévision LCD, internet ADSL WiFi, entrée jardin privé. à distance de marche de la plage et à 250 m de la gare. Le centre de Rome est d'environ 20 minutes en train. Zone archéologique étrusque à quelques kilomètres. Envoyer un e-mail pour connaître la disponibilité ». Vitesses en fonction du nombre de personnes et la durée du séjour. Nous préférons louer à la semaine et pendant de longues périodes le tableau des coûts seront réduits.